These curtains were used to divide a room and they are gorgeous! Good quality, heavy fabric, could not have looked richer. Iron the inside for the best look. Cover your windows with the rich, luxurious texture of 100-percent cotton velveteen with this Veratex velvet curtain panel. The soft fabric comes in several solid colors to coordinate with your current decor scheme in any traditional or formal room. Choose the length that fits your window, with choices from 63 to 120 inches. The 1.5-inch grommets along the top edge make hanging a breeze and allow you to easily open and close the curtain. 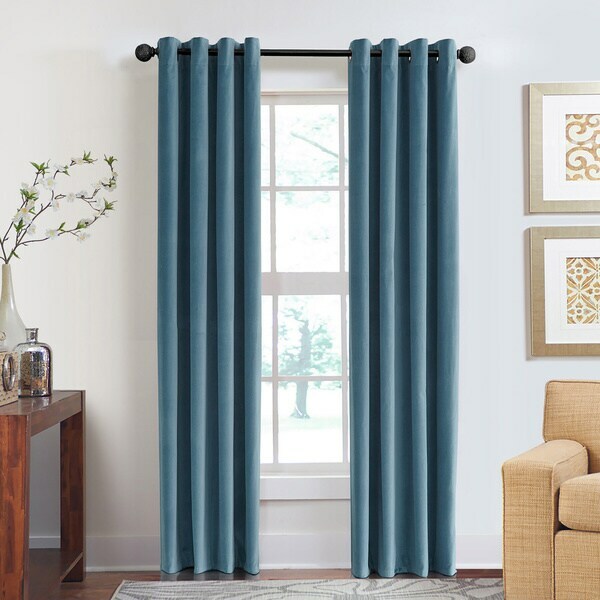 Simply slide your curtain rod through the grommets for a clean look. Close the heavy curtain for privacy, or open it to let the sunlight shine through. This product is not lined. not in any way luxury, almost completely see thru. And not made with real velvet either, just some kind of rough cotton. I can't believe what I paid for these, what a rip off!!! I am furious. I paid less money for a pair of lined drapes on here at the same time but they didn't have the color I wanted. I will keep them because the color is what I wanted. And I will have to purchase some liners to make them look heavier and more realistic. They practically float in the air. Velvet is supposed to be heavy. TOTAL RIP-OFF. I love these cotton velvet curtain panels so much I’m going to order some more. I would recommend them to a friend. "Do these curtains come in a set of 2 ? And which in your opinion is your most popular color. I just love the berry !" "Is the panel lined? The description says no, but the "Product Features" says that it is. I am looking for a curtain that has a blackout quality and Made in USA." it is not lined, unfortunately I didn't find that out until I spent over $100 on a product of lower quality than the ones I got at **** for $** for the pair, 3 years ago. "Do you have size 100 x 84? my window is kinda wide.."
"Will you be getting more of the 63" curtains. You only seem to have one panel each of the colors which interest me. (Blue smoke and silver) "
It depends on the availability of the product. Please check back with us. "is each panel 50 inches wide?" Hello klm2576, each panel is approximately 50" inches wide. Thanks for shopping with us! "How would you describe the Blue Smoke color? Is it more of a bluish green?" Hello Jen, we try to represent the colors of our products accurately. Unfortunately, due to the difference in monitor colors we cannot guarantee that the color will match exactly what you see on your screen. In my opinion, the Blue Smoke color is similar to an ocean blue; a blue with a green tint. Thank you for shopping with us. "Is the Juniper more of a blue/grey? Also, in details it shows that these curtains are not lined. Then in specs, it says that they are lined. Which is it?" Hello ntvhstn, in my opinion it does feature more of a blue and silver tone. Please see photo number nine for a close up of this item.